Saturday, June 15, departing at 8:00am (7:30am from the subway). Cost: ¥430 / ¥390 for members; Difficulty Level 3+. In Brief: Walk both restored and unrestored sections of Great Wall on the way from the Huanghuacheng Reservoir to a walled village that used to be a Ming Dynasty-era army barracks. Some sections steep! On the repaired end of the Great Wall at Huanghuacheng. 3–4 hours of hiking over approx. 5km. Note: The length of the hike is like a Level 2, but some of the climbing is more like what’s found on a Level 4. Just for a little while, though! This stretch of wall is part of the Huanghuacheng (Yellow Flower) Great Wall, and contains restored and unrestored sections for us to explore. We’ll start off near the Huanghuacheng Reservoir, and scramble up a hill trail to get on to the wall. This first section has been restored, and while a little steep in places, is good to walk on. After around 40 minutes, we’ll reach the highest point on this stretch—the base of a ruined tower—and take a break to enjoy the amazing views: back the way we came, the steep and twisting Huanghuacheng Great Wall rises from the reservoir and snakes off into the distance; to the east, farmland and small villages in a broad valley surrounded by mountains; to the west, the stretch of Great Wall that we’ll continue along. Following the wall, we dip down to the Zhuangdaokou Gate, an archway through which our Zhuangdaokou to the Walled village hike passes. The climb down to the archway is steep, and there are no ramparts or crenellations to hold on to – it’s necessary to take it slow and easy here. We’ll take a break at the archway, and gather our energy for the climb up the steep and tall stairs on the opposite side of the pass. After climbing the stairs, we’ll be following unrestored wall along a ridgeline for a little more than an hour, passing through five or six ruined towers. If we continued along the wall we’d arrive at the Little West Lake. Instead of heading for the lake, we’ll leave the wall and follow a hill trail to the Walled Village, passing through chestnut orchards and fields on our way back down to flat ground. The trail is not too steep, but can be bushy in places, particularly in summer. The Walled Village is a small settlement that has sprung up in and around an old army barracks that used to house soldiers tasked with guarding the Great Wall. The walls remain in good condition, and it’s possible to walk along the top of the walls just about all the way around the village. The village inside the walls is full of courtyard houses, old trees, and grindstones. After we’ve finished investigating the village, we’ll walk out to the main road to meet our bus, and head back to the reservoir to get lunch at our favourite local restaurant. There’s a lot of crossover with our other hikes in this area, and if you’ve done any of those then you will have probably done most of this hike already. It’s quite a short hike, but the climbing is steep—both up and down. The length of the hike is like a Level 2, but the climbing is more like what’s found on a Level 4. We had cool and cloudy weather for this hike, as well as long views of mountains and Great Wall—see 18 photos from the hike. Beautiful blue skies, blossoms, and Great Wall—see a set of 21 photos from the Huanghuacheng Great Wall. 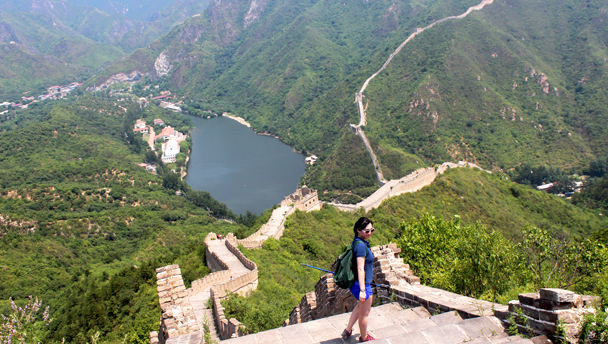 See 14 photos from a hike at the Huanghuacheng Great Wall. It was a chilly and bleak day out on the Great Wall at Huanghuacheng—just lovely for a hike! See 16 photos. Take a look at 24 photos from a hike at the Huanghuacheng Great Wall—blue skies, views of reservoirs, mountains, and Great Wall. 35 photos from a blue-skies hike from Huanghuacheng to the Walled Village. Take a look at 29 amazing photos from a hike at the Huanghuacheng Great Wall—big blue skies, clear weather, and awesome views of the Great Wall. Seventeen photos from a hike along the Great Wall at Huanghuacheng—blue skies, green hills, and superb views of the Great Wall. See 14 photos from a hike on the Huanghuacheng Great Wall—great views, and the start of the season’s blossoms. See 17 shots from a walk on the Great Wall at Huanghuacheng, starting by the reservoir and finishing by the Walled Village. Twenty-three photos from a walk in the hills of Huairou District, passing fields and orchards on the way to the Huanghuacheng Great Wall. Seventeen photos from a beautiful day out at the Huanghuacheng Great Wall – blue skies and flowers blooming. Sixteen photos from a beautiful blue sky hike along the Great Wall at Huanghuacheng. Twenty-two photos from our hike from the Walled Village up to and along the Huanghuacheng Great Wall. 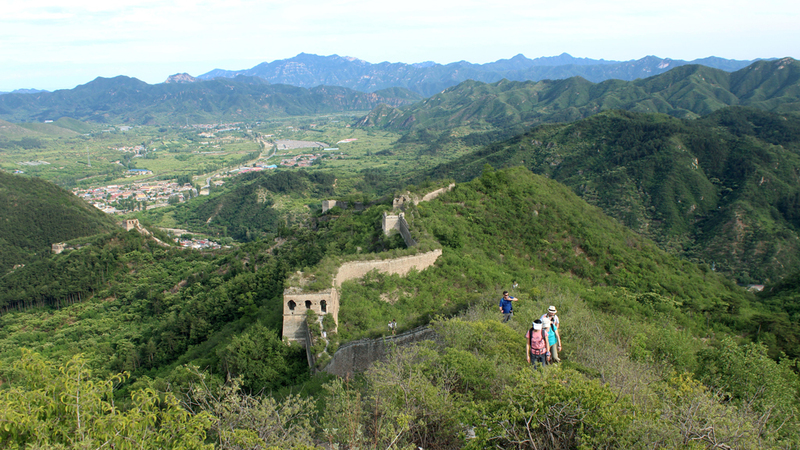 See eighteen photos from our hike from the Walled Village up to the Huanghuacheng Great Wall. Photos of a short-but-steep hike along a section of the Huanghuacheng Great Wall in Huairou District.